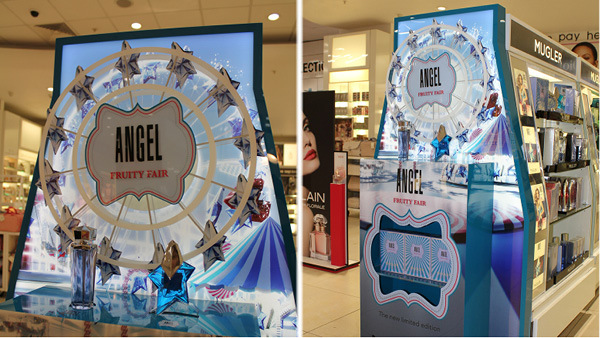 Through our collaboration with Clarins, on their new limited-edition Angel Fruity Fair Perfume, we brought the fun of the fairground to retail. We created 20 custom built free standing, Ferris Wheel featuring, display units that created impact and standout in the competitive space of perfume. The gift-ends were featured across 20 Debenhams stores, with each unit built from an MDF structure with a vacuum formed base and shelf cladding. Internal lighting was added to bring the unit to life along with a mains powered motor that activated the ferris wheel to move around.